For the sake of any visitors we might have, this Fall we have been journeying through the great stories of the Bible, and we started with Genesis at the beginning of September and now find ourselves in Jeremiah. It has been a fascinating trip, seeing God travel with God’s people over the centuries, through the many ups and downs that life had thrown at them. And at this point in the arc of their story together, they find themselves on the brink of yet another disaster. And it’s been that way for a while now, at least the last three Sundays worth of stories. Last week we were at the point where the kingdom of Judah, the last remaining kingdom of God’s people, had been all but overrun by the Assyrian empire. Only the capital city of Jerusalem remained untouched. But, with a little help from God, the city remained intact and was not taken by Assyrian forces. But the threat that Assyria would return, with an even bigger army, was ever present. However, some time has passed, not a long time, but enough that God’s people have become comfortable again—which brings us to the prophet Jeremiah. In today’s reading, we actually get two stories, one from the beginning of the book of Jeremiah, and one from a little later in the book. The first story is the call of Jeremiah to be a prophet for Jerusalem. It’s a conversation between him and God that immediately endears the reader to both of them. At times the conversation is reminiscent of one between a parent and a child, at other times between a student and mentor, and still others as between an employer and employee. Regardless, it’s a very relational conversation, to say the least, very personal, very intimate. It really is a gift for us to get a glimpse of it. God begins with words that I think every child would love to hear, “Before I created you in the womb I knew you; before you were born I set you apart.” Who wouldn’t want to hear that from a parent? The idea of knowing a child before they were born is something that Sara and I can relate to. Having endured many miscarriages before our girls were born, when they finally did come to us, they were, and are, literal living, breathing, dreams fulfilled. God continues, “I made you a prophet to the nations.” That’s quite a job to be tasked with! 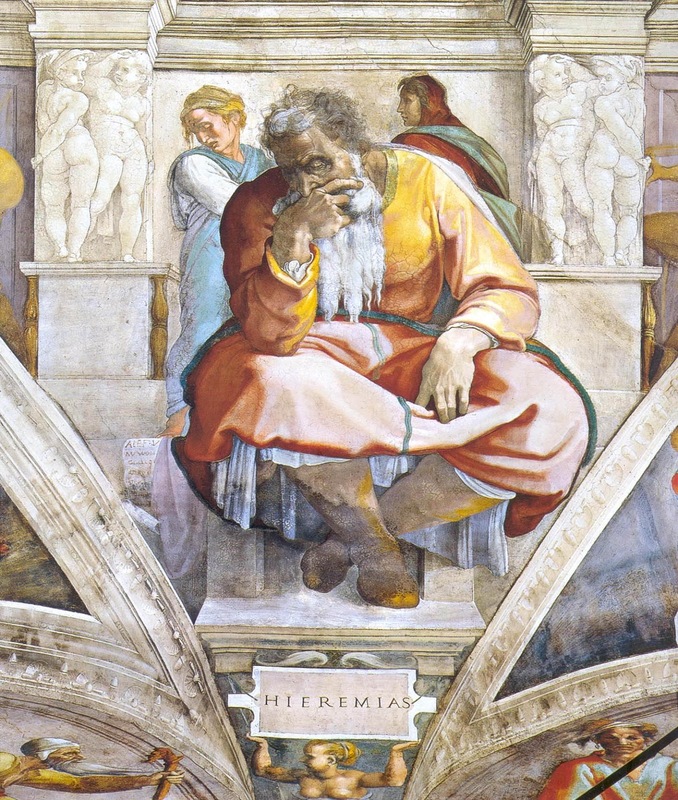 And so, Jeremiah responds like so many others had before him, and probably the way you and I would respond, “Who me?” Most people would probably come up with the best reason as to why this is a bad idea! And for Jeremiah, it was his age and inexperience. He goes so far as to call himself a child, someone who doesn’t even know how to speak properly! God’s not buying it. Because God knows something that Jeremiah had not yet discovered. That not only will God provide words for Jeremiah, not only will God provide legitimacy for Jeremiah, but God will be by his side, every step of the way, as God had been, even before he was born. This is something that God needs Jeremiah to understand, before he begins his work as a prophet, in order for his message to God’s people to be effective. And this will be clear in a minute. So, Jeremiah begins the hard work of being a prophet. And if I think being a pastor is hard, there’s no way I’d want his job! Although, there are quite a few similarities between a prophet and a pastor. A prophet is called to be a truth-teller, and so is a pastor, even when the truth is difficult. A prophet is called to be a voice for God, and so is a pastor, even when that voice speaks difficult words. A prophet is called to love people, and so is a pastor, even when that comes in the form of tough love. But we are also very different employees of God’s. A prophet is called when there is no hope left. As I’ve mentioned before, when a prophet is called to the scene, it’s already too late. And so, a prophet’s message is usually filled with doom and gloom, especially in Jeremiah’s case. Now, for some pastors, like myself, who have walked with a congregation to its closing, I can relate to this kind of work too but most pastors, thankfully, are not called to that kind of work. Therefore, Jeremiah goes to God’s people in Jerusalem, in the temple to be exact, with a reality check that can only come from a prophet. He tells them that this is God’s temple, not there’s. And as such, God sees everything that goes on there! And what God was seeing, God wasn’t liking! They had become so comfortable, in spite of Assyria breathing down their neck, that not only were they taking advantage of immigrants, taking advantage of orphans, taking advantage of widows, not only were they committing murder in the temple, committing adultery in the temple, committing perjury in the temple, but now they were sacrificing to other gods in God’s temple! And that last sin, at least for the author, was the last straw. And so, God tells them, this level of comfort that you have in this place, this level of presumed safety that you have in this place, is false! Especially because, it isn’t going to last. You see, God knew something else that they didn’t. God knew that the temple would soon be destroyed, that the entire kingdom would soon fall into enemy hands, including the capital city of Jerusalem, the city that has somehow escaped tragedy for a long time. And it isn’t even going to be the Assyrians that do it! The Babylonians are going to take over the Assyrian empire and they are the ones that will soon take this little kingdom, or what’s left of it, for their own. But that’s beside the point, the point is, everything that they have found comfort in, is about to go away. More than that, they are not only going to lose their temple, not only are they going to lose their country, they are going to lose their land, as the Babylonians will exile them by systematically relocating them by force. Since we started this journey back in September I have been hinting that some terrible times are in store for God’s people in this narrative, and though they’ve been through a lot already, the worst is about to happen. And so, they will have to relearn what it means to be God’s people—without the comfort of the temple, without the safety of a nation, even without their own land beneath their feet. But I don’t want us to get too ahead of ourselves. I see these stories from Jeremiah, as one more attempt by God to prepare them for what is to come. And yes, it comes in the form of some tough love. And I’m sure many of us have been the recipient of tough love by those who raised us and know that it’s not much fun but also know just how necessary it is sometimes. Because God knows what’s ahead for them God needs them to learn this hard lesson because when they are ultimately exiled, they will need to know, right down to the marrow of their bones, that God is still with them! That God is not tied to a temple, not tied to a kingdom, not tied to the land, but is tied to their very hearts! Which is why it was so crucial that God convinced Jeremiah of this, way back when God first called him. And so it is with us. A major part of our faith lives is preparing us for exile, preparing us for those times in our lives when nothing seems to go right, those times in our lives when God seems farthest away, those times in our lives when comfort seems like a dream, when safety seems like a fantasy, those times in our lives when we feel taken by an enemy of some kind. It is in those times that the message of God through Jeremiah is so crucial—that it is God’s will to dwell with you, to be with you, to walk with you—in spite of where life takes, in spite of what you’ve done or left undone, in spite of your losses—God’s wants to be with you. And I think it’s safe to say, God gets what God wants. Thanks be to God. Amen.